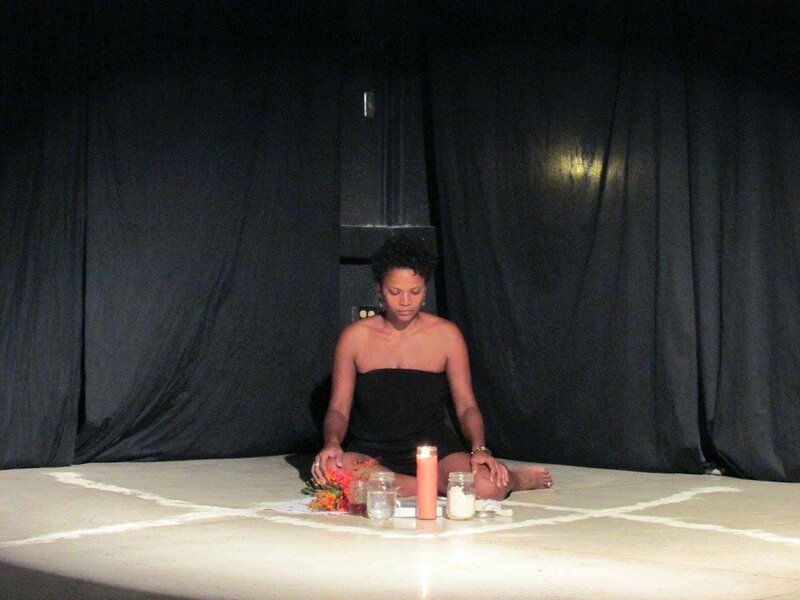 Kyana Brindle is an interdisciplinary performing artist from New York City. She has worked collaboratively and as a solo artist, premiering her one-woman show ‘Between Spaces’ at the Nuyorican Poets Cafe. She has been a member of various artist collectives, and has performed for over twenty years as a poet, vocalist and actor in New York, Belize, Beijing and beyond. She has used creative engagement as tools for social change, facilitating workshops with youth and adults in educational and community spaces. Her work addresses themes of healing and identity, reframing of personal and cultural narratives, and spiritual and artistic practice. Kyana is Co-Founder and Director of Artist Engagement for Nfinit Foundation Arts, and Co-Director of the Nfinit Foundation Artist Residency which offers subsidized studios and exhibition space to artists of the Diaspora, POC and LGBTQ+ communities. Recent performances focus on the use of ritual elements to create spaces of shared healing experiences with audiences, and an interest in the exploration of emotional and creative processes which facilitate becoming agents of change in our lives and communities. Developed with Novel Idea of Nfinit Foundation Arts, Naked Layers is a multimedia film project exploring vulnerability, body image, identity, and representations of black women. Naked Layers was exhibited in Looking to the Self, Looking Into Others: An Intersectional Conversation hosted by Garner Arts Center and ArtShape Mammoth at the Garner Arts Festival in New York, 2017. Kyana Brindle and Novel Idea were interviewed about the Naked Layers project here.